Frank Zalom: Champion of IPM! 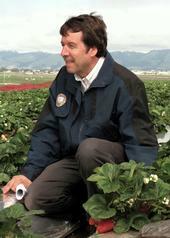 IPM specialist Frank Zalom, UC Davis distinguished professor of entomology and Extension entomologist, checks over a strawberry field. Protect bees from pesticides by using bee precaution ratings from the UC ANR Statewide IPM program. 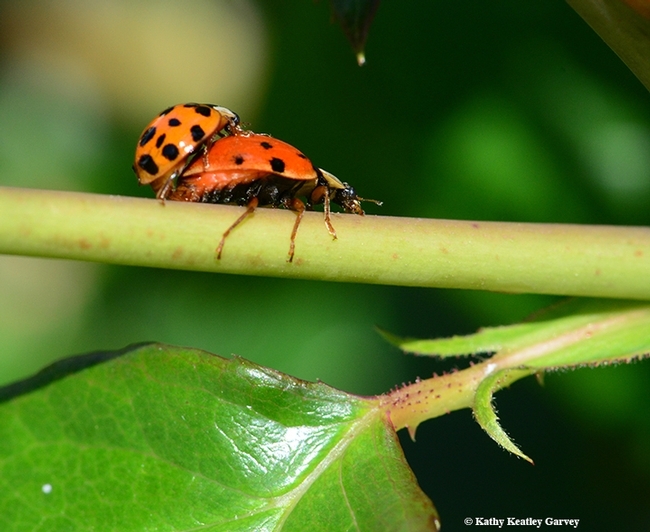 Various insects, birds, and other animals pollinate plants. Bees, especially honey bees, are the most vital for pollinating food crops. 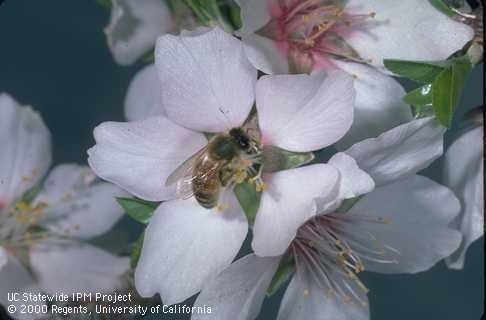 Many California crops rely on bees to pollinate their flowers and ensure a good yield of seeds, fruit, and nuts. Pesticides, especially insecticides, can harm bees if they are applied or allowed to drift to plants that are flowering. 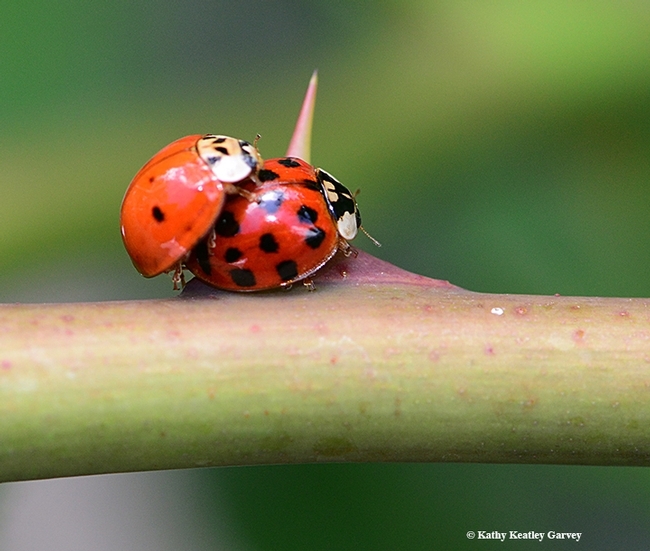 Our mission at the University of California Agricultural and Natural Resources (UC ANR), Statewide Integrated Pest Management Program (UC IPM) is to protect the environment by reducing risks caused by pest management practices. UC IPM developed Bee Precaution Pesticide Ratings to help pest managers make an informed decision about how to protect bees when choosing or applying pesticides. You can find and compare ratings for pesticide active ingredients including acaricides (miticides), bactericides, fungicides, herbicides, and insecticides, and select the one posing the least harm to bees. Ratings fall into three categories. Red, or rated I, pesticides should not be applied or allowed to drift to plants that are flowering. Plants include the crop AND nearby weeds. 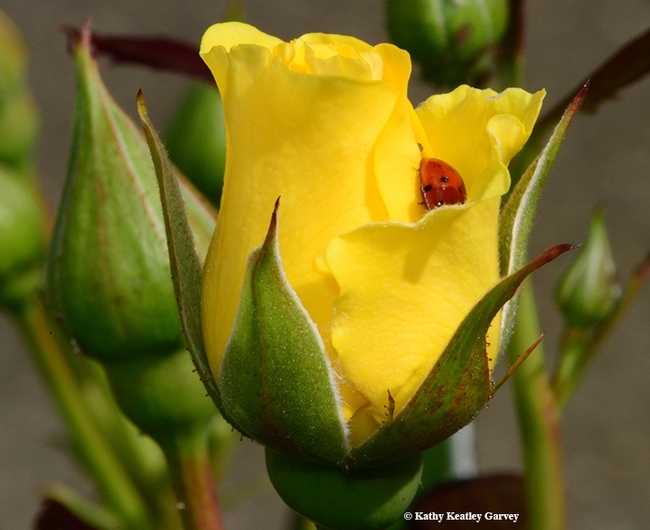 Yellow, or rated II, pesticides should not be applied or allowed to drift to plants that are flowering, except when the application is made between sunset and midnight if allowed by the pesticide label and regulations. Finally, green, or rated III, pesticides have no bee precautions, except when required by the pesticide label or regulations. Pesticide users must follow the product directions for handling and use and take at least the minimum precautions required by the pesticide label and regulations. A group of bee experts in California, Oregon, and Washington worked with UC IPM to develop the Bee Precaution Pesticide Ratings. They reviewed studies published in scientific journals and summary reports from European and United States pesticide regulatory agencies. While the protection statements on the pesticide labels were taken into account when determining the ratings, it is important to stress that UC IPM's ratings are not the pollinator protection statements on the pesticide labels. In a number of cases, the ratings suggest a more protective action than the pesticide label. The UC IPM ratings also include active ingredients that may not be registered in your state; please follow local regulations. 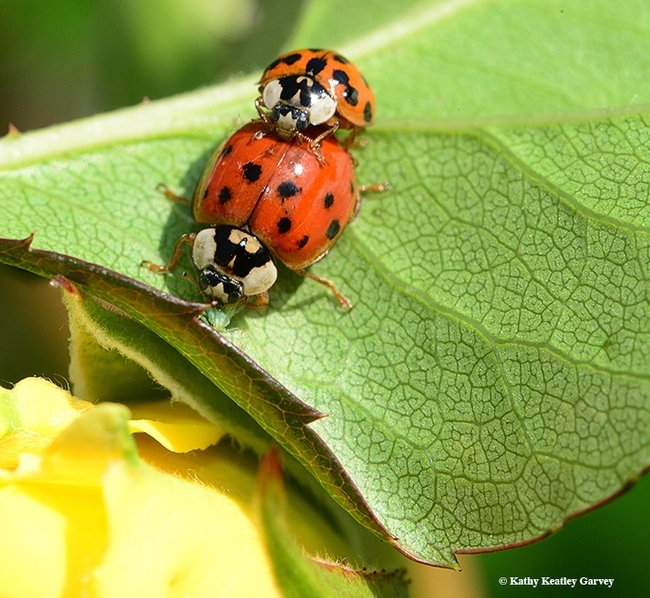 In California, the suggested use of the bee precaution pesticide ratings is in conjunction with UC Pest Management Guidelines (for commercial agriculture) and Pest Notes (for gardeners). Each crop in the UC Pest Management Guidelines has a link to the Bee Precaution Pesticide Ratings database and provides guidance on how to reduce bee poisoning from pesticides. For more information on protecting bees from pesticides, see UC IPM's Protecting Natural Enemies and Pollinators, and use the Bee Precaution Pesticide Ratings. About 100 high school students attended workshops at Kearney to explore how math and science help agriculture and natural resources. Reedley College provides upward bound math and science programs to 405 students from ten high schools ranging from Madera to Dinuba. These programs serve mainly low-income and first generation college bound students with a goal of generating enthusiasm for science and math leading to increased college enrollment. About a quarter of these students attended workshops at Kearney in June and July. Kris Tollerup, UC Cooperative Extension advisor in the statewide IPM program and at Kearney Agricultural Research & Extension Center (KARE), almond, pistachio, tree fruit and grapes, taught a workshop on integrated pest management (IPM) strategies and practices. Students went to the fields and performed insect collection sweeps in alfalfa. They used dissecting microscopes to assist with identification of beneficial, neutral, and pest insects. Students learned about IPM strategies as well as how the practices and crops in one grower's field can impact his or her pest pressure as well as the pest pressure in a neighboring grower's crop. Andreas Westphal, UC Cooperative Extension assistant specialist in the Department of nematology at UC Riverside and KARE, pathogens and nematodes affecting plants, taught the students about nematodes. Students used compound and dissecting microscopes to help identify different nematodes and different stages of nematode development. Samples of plant damage were also available. This workshop included IPM strategies for plant parasitic nematode pest management. Jeff Mitchell, UC Cooperative Extension specialist at KARE, statewide cropping systems, taught the students about population predictions and the need to find ways to increase food production, increase available quality water, and sustain the environment. Students learned about conservation tillage, soil texture, soil stability, and leadership. They conducted soil texture and soil stability tests. Students discussed how much better the conservation tillage soil's stability and water infiltration was compared to the conventional tillage soil. Themis Michailides, plant pathologist in the Department of plant pathology at UC Davis and KARE, ecology, epidemiology and control of fungal diseases of fruit and nut crops and vines, postharvest diseases, aflatoxin and mycotoxins of nut crops and figs, taught students about different pathogens, beneficial organisms, and the impact of certain organisms. Students used compound and dissecting microscopes. Larger samples were also available to see the symptoms and visible damage to the host plant. IPM strategies were discussed. KARE staff provided 3 workshops. -Students learned about sensory evaluation. Students took turns preparing and delivering samples and being the consumer that determined consumer acceptance. Different strategies to make the data more robust were discussed and demonstrated. Students discussed the results and observed the variation in consumer preferences. They used raw agricultural as well as value added commodities. There was insufficient time for statistical analysis, but the general concepts and impact of statistical analysis were discussed. -Students discussed different experimental designs and terms. They visited actual research fields and learned how the plots are laid out and how the variables are controlled to help address certain issues and obtain robust data that is useful to stakeholders. 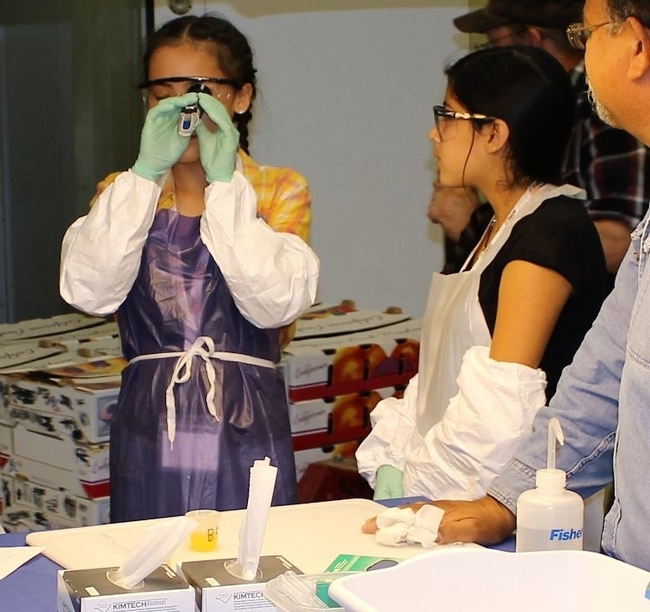 -Students also learned how and why fruit maturity and quality standards were set, as well as methodologies for determining fruit maturity and quality. They performed fruit maturity and quality testing in a laboratory setting and compared their objective and subjective assessments of the fruit. To get the sugar to acid ratio, students conducted titrations and used refractometers. Students used a penetrometer to determine fruit firmness. Some of the students toured other labs in the facility and learned about pathology efficacy trials and altered atmosphere strategies. Upward bound math and science students using a refractometer to help determine the sugar to acid ratio in citrus samples. 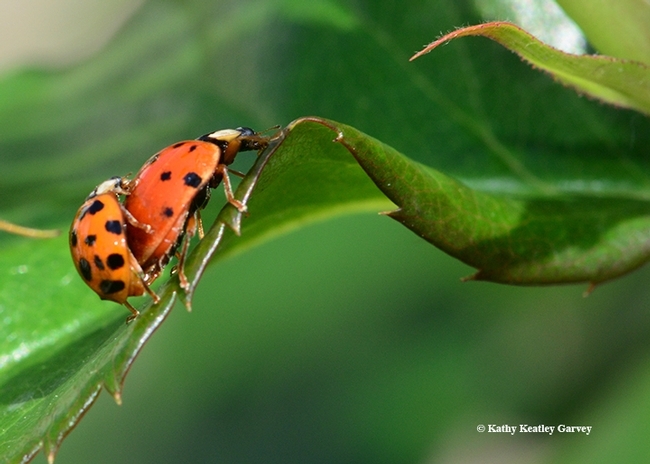 Integrated pest management extension helps Guatemalan farmers. As part of the Farmer-to-Farmer Program sponsored by the Partners of the Americas and funded by the United States Agency for International Development (USAID), Walter Bentley, UCANR integrated pest management entomologist, emeritus, at Kearney Agricultural Research & Extension Center, and Washington State University entomologist Jay Brunner traveled to Guatemala in April to help growers improve the peach and apple industry. Their primary goal was to identify pest problems and possible solutions to help peach and apple growers improve fruit production, taking into account the region's unique climate. Bentley and Brunner worked with the Asociación Nacional de Productores de Frutales Deciduos (ANAPDE) and its director, Armando Hernandez, to reach out to various growers in the area. Bentley and Brunner set out to identify insect and mite problems. Fortunately, they found that there were only a few entomological problems. 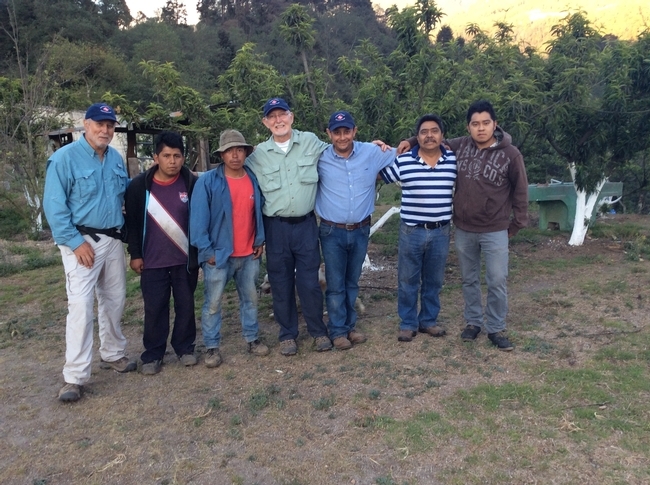 Jay Brunner (far left), Walter Bentley and Armando Hernandez (center), with family members from one of the Guatemalan farms visited in April, 2016.